President Kerrigann Cosgrove, Vice President Savannah Sturguess, Secretary Jaylene Sturguess, Treasurer Brianna Eckert, Reporter Shelley Rucker, Historian Mason Mayers, Recreation Director Courtney Reger, Communication Director Baily Fox, and Community Service Directors Brett Clark and Chris Noble. Savannah and Jaylene Sturguess will also serve as officers for District 19 during the 2013-2014 school year. Members of the Grand River Technical School Future Business Leaders of America (FBLA) Chapter recently attended the 2014 Missouri FBLA Leadership Conference held on April 13-15 in Columbia, Missouri. Over 3,760 members and advisers representing 450 chapters throughout the state met to elect state officers, transact business of the state chapter, participate in leadership and career workshops, and compete in the state leadership awards program. The 2014 conference was the largest conference in the event's 56 year history. Winning recognition at the state conference were: 1st place in Business Presentation - Alan Kline, Ali Stephens, and Megan Churchill; 6th place in Computer Applications - Kerrigann Cosgrove; 6th place in Database Design - Clay Morris; 9th place in Spreadsheet Applications - Mary Bligh; 10th place in Cyber Security - John Stone. Additional members representing GRTS in the state competition were: Courtney Reger - FBLA Principles and Procedures; Haley Cheeney - FBLA Principles and Procedures; Ryan Smith and Trent Moore - Virtual Business Challenge; Trey Batye and Steen Anthony - Management Decision Making; John Stone - Networking Concepts; Savannah Sturguess - Healthcare Administration; Kendra Cobb - Introduction to Information Technology; Kerrigann Cosgrove, Brianna Eckert, and Amanda Norman - Business Ethics; Robbie Parkey - Agribusiness; Ruby Whitte and Kiara Botts - EBusiness Website; Savannah Shriver - Impromptu Speaking; Ruby Whitt - introduction to Business Communications; Haley Lewis and Skylar Ewing - Life Smarts; Steven Cooper - Cyber Security; Caitlin Fechtig - Introduction to Business; Skylar Ewing - Introduction to Information Technology; A.J. Mosier - Business Law; Brett Clark - Economics; Bradley Ogle - Computer Problem Solving; and Clay Morris - Accounting I. The chapter is allowed three voting delegates to elect the 2014-2015 FBLA state officers, and Caitlin Fechtig, Skylar Ewing, and Kiara Botts were chosen for this honor. In addition, Baily Fox, Jaylene Sturguess, and Courtney Reger served on the Buzz Squad at the conference where they took pictures, updated FBLA Facebook and Twitter, and created PowerPoints for future viewing. Jenny Hughes, Susan Mayers, and Sondra Sturguess are the local chapter advisers and accompanied the students to the conference. Special recognition was given at the conference to Jayme Caughron (GRTS Director) as Administrator of the Year, Jeff Frampton (Hy-Vee) as Business Person of the Year, and Kerrigann Cosgrove as Outstanding FBLA member. All were nominated by the GRTS FBLA chapter for their respective awards. The Business Presentation Team of Alan Kline, Ali Stephens, and Megan Churchill qualified for nationals and will attend the National Leadership Conference in Nashville, TN, June 29-July 3, 2014 along with adviser Susan Mayers. The Grand River Technical School chapter of Future Business Leaders of America (FBLA) competed in district competition on Tuesday, February 18, at North Central Missouri College in Trenton. Savannah Sturguess, District 19 Secretary, and Jaylene Sturguess, District 19 Treasurer, helped lead the opening/closing sessions and distribute awards later in the day. Sixty-nine members finished in the top ten places in a variety of events and thirty qualified for state. Savannah Sturguess was elected as District 19 President, and Jaylene Sturguess as District 19 Secretary for the 2014-2015 school year. District 19 Officers were elected for the 2014-2015 school year. Abbey Rounkles (Tina Avalon), and Vice President of Membership Brittany Tolias (Concordia). 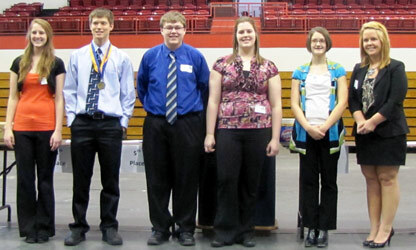 To qualify for state, the members had to place in the top five for online testing and top one for all other events. The following students qualified to compete at the State Leadership Conference in Columbia from April 13-15: Clay Morris, Accounting I and Database Design; Robbie Parkey, Agribusiness; Kerrigann Cosgrove, Brianna Eckert, and Amanda Norman, Business Ethics Team; John Stone, Cyber Security and Networking Concepts; Steven Cooper, Cyber Security; Savannah Sturguess, Healthcare Administration; Caitlin Fechtig, Introduction to Business; Skylar Ewing, Introduction to Information Technology; Kendra Cobb, Introduction to Information Technology; Mary Bligh, Spreadsheet Application; A.J. Mosier, Business Law; Brett Clark, Economics; Bradly Ogle, Computer Problem Solving; Alan Kline, Ali Stephens and Megan Churchill, Business Presentation Team; Courtney Reger, FBLA Principles and Procedures; Haley Cheeney, FBLA Principles and Procedures; Kerrigann Cosgrove, Future Business Leader and Computer Applications; Savannah Shriver, Impromptu Speaking; Ruby Whitt, Introduction to Business Communications; Trey Batye and Steen Anthony, Management Decision Making Team; Haley Lewis and Skylar Ewing, Life Smarts; Kiara Botts and Ruby Whitt, E-Business Website; Ryan Smith and Trent Moore, Virtual Business Challenge; Baily Fox and Jaylene Sturguess, voting delegates. If students finish in the top two at state, they will have the opportunity to compete at the National Leadership Conference in Nashville, Tennessee. The Grand River Technical School chapter of Future Business Leaders of America (FBLA) members competed in performance events at the District 19 Leadership Conference on February 18. Performance events ranged from preplanned business presentations to analyzing case studies and presenting solutions on a variety of topics. 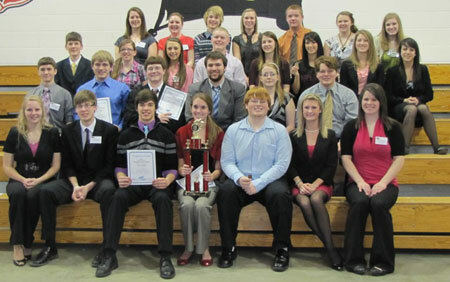 Other students who placed in the top 10 in a variety of competitive events include Bradley Ogle, Mindy Hayes, Ryan Smith, Savannah Sturguess, Brittany Stanfield, Maggie Resor, Rebeka Soasty, Trent Moore, Karson Keithley, Katelyn Parkey, Maggie Leatherman, Haley Lewis, Jaylene Sturguess, Morgan Dowell, Baily Fox, Cole Distler, Kiara Botts, Jessica Morris, Skylar Ewing, Kendra Cobb, Ronnie Reynolds, Courtney Reger, Samantha Baldwin, Amanda Norman, Brianna Eckert, Halee Jones, Brett Clark, Hanna Howard, Madison Gregory, Alan Kline, Trey Batye, Noah Holland, Mason Mayers, Nick Meyers, and Mary Bligh. On Wednesday, October 23, approximately 40 members of the Future Business Leaders of America (FBLA) chapter from Grand River Technical School visited businesses in the Kansas City area. The first tour was The Roasterie, a specialty coffee-roasting company. The Roasterie imports coffee beans from 31 different coffee-producing countries. Students watched a video on how entrepreneur Danny O'Neill became interested in the coffee business while studying abroad, where the coffee is grown and how it is air roasted. A coffee taster demonstrated the system used to test coffee, and a tour of the plant was given. The second business the FBLA members toured was the National Weather Service Training Center. Meteorologist Megan Taylor, 2004 Chillicothe High School graduate, helped lead the tours. Students observed how air travel is monitored and met meteorologists who track the data and contact air traffic controllers to reroute flights as needed. The tour also included viewing the multiple types of equipment used to gather weather data. The center is used for training people in the region how to use and repair equipment at various sites. Each business exposed students to a variety of careers, international business, and the use of technology in those businesses. Students were chaperoned by FBLA Advisers Jenny Hughes and Sondra Sturguess and bus driver Denny Sturguess. During the 2012-2013 year-end program held May 21, 2013, the 2013-2014 local chapter officers were installed with current president Maura Sturguess conducting the ceremony. New officer positions were created to help the chapter reach more members and be more actively involved in community service. The new officers include: President Kerrigann Cosgrove, Vice President Savannah Sturguess, Secretary Jaylene Sturguess, Treasurer Brianna Eckert, Reporter Shelley Rucker, Historian Mason Mayers, Recreation Director Courtney Reger, Communication Director Baily Fox, and Community Service Directors Brett Clark and Chris Noble. Savannah and Jaylene Sturguess will also serve as officers for District 19 during the 2013-2014 school year. Grand River Technical School's Future Business Leader of America attendee Maura Sturguess represented the State of Missouri in the Electronic Career Portfolio competition. 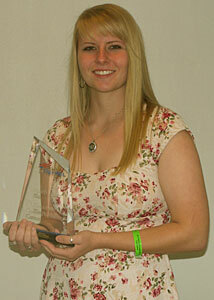 She advanced to the national level through her second place finish at state in April. At this convention, Maura came away with several honors. During opening ceremonies on June 27th, she was awarded an FBLA Distinguished Leader Scholarship for $500 with another $500 at the time of her joining PBL (college level of FBLA). In the North Central Missouri Regional meeting on June 30th, Maura received her America level certificate and pin for the highest level of the Business Achievement Awards. And, to finish out the week, at the Awards of Excellence program held on June 30th, she earned 9th place honors in her Electronic Career Portfolio event. Future Business Leaders of America-Phi Beta Lambda (FBLA-PBL), the largest and oldest student business organization, held its National Leadership Conference in Anaheim, California, on June 27-July 1, 2013. Participants from around the country were in attendance for this exciting conference to sharpen their core business skills, expand their networks, and participate in competitive events. The competition is part of a competitive events program sponsored annually by FBLA-PBL, a professional association for students pursuing business careers. Individuals, local chapters, and state teams compete in over 50 events representing a range of business, career, and leadership development activities. The winners of these challenging and prestigious awards are selected from FBLA-PBLs over 230,000 members and have won regional and state competitions to qualify for the national awards program. The competition vying for top honors included state representatives from across the United States, Puerto Rico, the Virgin Islands, Bermuda, Guam, the Cayman Islands, and the Department of Defense schools worldwide. There were 9,000 delegates, advisers, and judges in attendance at this 61st annual conference, making it the largest number attended in history. In addition to competition, Maura attended educational workshops, visited an information-packed exhibit hall, elected national student officers, attended state meetings as well as the Opening Session with a motivational keynote speaker. While in Anaheim, Maura, accompanied by adviser and mother Sondra Sturguess, visited Disneyland, attended a medieval dinner theatre, and walked on the beach. Maura will be attending Southwest Baptist University in Bolivar starting this fall where she will major in Accounting and Information Assurance. Future Business Leaders of America (FBLA) from Grand River Technical School held its annual recognition program on Tuesday, May 21, at Simpson Park followed by a BBQ and game night. During the program, FBLA members were recognized for their participation in various activities throughout the year including district and state competitions plus outstanding service within the chapter. Special awards were given to Maura Sturguess and Anna Pitchford in honor of their outstanding leadership as District 19 officers. Maura Sturguess was given the Outstanding Senior award for her commitment to helping the chapter with community service projects, fundraisers, and her success at district and state competition for the past four years. Derek Gray was given the Adviser award for his willingness to help with any project throughout the year. Derek's enthusiasm was a spark plug in getting other students involved in chapter activities. The chapter has a point system set up for points earned by active involvement in activities throughout the year. Those reaching/exceeding a certain number of points will letter for the year. Repeating letters included Maura Sturguess, Anna Pitchford, Derek Gray, and Savannah Sturguess; new letters included Grant Peterson, Mason Mayers, Courtney Reger, Shelley Rucker, Robert Parkey, Kerrigann Cosgrove, Jaylene Sturguess, Madison Gregory, and Austin Mosier. Those just short of lettering and receiving Outstanding Service certificates included Brianna Eckert, Garrett Peterson, Riley Rasche, and Maggie Resor. Savannah Sturguess received Top Point Earner and a $10 gas card. Business Achievement Awards (F, B, L, A) are individual awards members can earn through activities set by state and national FBLA that stress Service, Progress, and Education. Each level builds on the next, and it gets progressively harder as each level is earned. All members were encouraged to attempt the BAA for next year. The F and B are recognized at the chapter level, L at the state level, and A at the national level. Members receiving BAA pins this year included Jaylene Sturguess (F), Savannah Sturguess (F, B) and Maura Sturguess (B, L, A). During the program, the 2013-2014 local chapter officers were installed with current president Maura Sturguess conducting the ceremony. New officer positions were created to help the chapter reach more members and be more actively involved in community service. The new officers include: President Kerrigann Cosgrove, Vice President Savannah Sturguess, Secretary Jaylene Sturguess, Treasurer Brianna Eckert, Reporter Shelley Rucker, Historian Mason Mayers, Recreation Director Courtney Reger, Communication Director Baily Fox, and Community Service Directors Brett Clark and Chris Noble. Savannah and Jaylene Sturguess will also serve as officers for District 19 during the 2013-2014 school year. Advisers Jenny Hughes, Susan Mayers, and Sondra Sturguess would like to thank all the students, parents, school staff, and community members for their assistance and support in helping with projects and events throughout the year. Members of the Grand River Technical School's Future Business Leaders of America (FBLA) Chapter recently attended the 2013 Missouri FBLA Leadership Conference held April 21-23 in Columbia, Missouri. Over 3,000 members and advisers representing 403 chapters (20 districts) throughout the state met to elect state officers, transact business of the state chapter, participate in leadership and career workshops, and compete in the state leadership awards program. Winning recognition at the state conference were: Maura Sturguess with 2nd place in Electronic Career Portfolio; Savannah Sturguess with 3rd in Database Applications; Robbie Parkey was 5th in Introduction to Business; Brittany Stanfield and Grant Peterson were 7th with their Entrepreneurship team. Other delegates representing GRTS at the state competitive leadership conference were: Anna Pitchford-Client Services; Mindy Hayes-Accounting I; John Stone-Computer Problem Solving; Chris Noble-Technology Concepts; Derek Gray and Anna Pitchford-Local Chapter Annual Report; Alan Kline and Jarod Cox-Business Plan; Savannah Sturguess-Spreadsheet Applications; Maura Sturguess-Future Business Leader; Shelley Rucker-Introduction to Business Communications; and the team of Jaylene Sturguess, Brett Clark, Trey Batye-Management Decision Making. Jenny Hughes, Susan Mayers, and Sondra Sturguess are the local chapter advisers and accompanied the students to the conference. In addition to the awards, the chapter was awarded many certificates for their participation in state events: In Praise of Age, Camp Quality, March of Dimes, Environmental Awareness, Reach Out and Care, and the National Travel Fund. As FBLA District 19 president, Maura Sturguess was part of the state executive board helping with the state officer elections and facilitating a workshop. 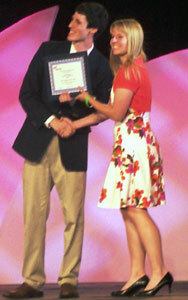 Maura Sturguess also placed 3rd in Who's Who in Missouri FBLA and received a $400 Joanne Newcomer scholarship. She will be competing at nationals in Anaheim, CA June 28June 30, 2013 in her Electronic Career Portfolio. Robbie is a freshman in the Ag department at the Grand River Technical School, and this is his first year as a member of FBLA. He competed at State FBLA Conference in Introduction to Parliamentary Procedures. This is an online multiple choice test designed to test your knowledge about parliamentary procedures. Robbie placed 5th in this event. The team of Brittany Stanfield and Grant Peterson earned 7th place at State FBLA Conference on April 23, 2013 in their entrepreneurship team competition event. The team placed 8th among the competition on the online multiple choice test. They then had to present in front of a panel of three judges. In this presentation phase, the team members are placed in a preparation room and given a scenario/case study to review. After 20 minutes prep time, they then present their recommendations to the judges on how the case study should be handled using entrepreneurship procedures. Brittany is a junior and Grant is a senior at the Grand River Technical School. Sophomore GRTS FBLA member, Savannah Sturguess, earned 3rd place honors at FBLA state conference on April 23, 2013 in Columbia, MO. Savannah competed in two events - Spreadsheet Applications (Microsoft Excel) and Database Applications (Microsoft Access). Both of these tests consist of two parts; an online multiple choice knowledge test and a skills test to see how well you can use the software in real-life situations. She placed 3rd in her Database Applications competition. This is Savannah's second year in FBLA, and she is currently the GRTS FBLA chapter secretary and will serve as District 19 secretary for the 2013-2014 school year. During State FBLA conference held in Columbia, MO on June 21-23, 2013, GRTS FBLA member Maura Sturguess placed 3rd as Who's Who in Missouri FBLA. The Who's Who competition is set up on a points system based on how involved a member is in FBLA. Each district can submit only one member for this event; there are 20 districts in Missouri. The member must put together a resume as outline by the competition guidelines and each section is judged and awarded points. Maura earned enough points to place 3rd behind two state officers. She has been a member of the GRTS FBLA for four years. During this time, she has been a chapter officer (president 3 yrs, historian 1 yr) and a District 19 officer (president 2 yrs, reporter 1 yr). 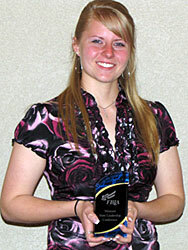 Maura Sturguess, senior at Grand River Technical School, qualified for FBLA nationals during the state conference on April 23, 2013. She competed in Electronic Career Portfolio and placed 2nd. This event is comprised of two parts; a prejudged and a presentation section. The FBLA member must create a portfolio based off of FBLA requirements that tell about his/her future career choice while showing how their experiences and achievements during high school help towards their career. This portfolio must be all electronic based. During the prejudged section, Maura placed in the top five of 20 FBLA districts in the State of Missouri. In the performance section, she presented her portfolio to a panel of three judges. This final presentation was open for viewing by other FBLA members and advisers. 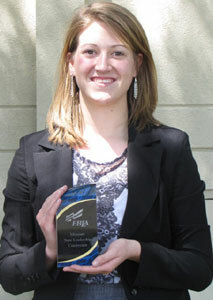 Maura will compete at FBLA nationals in Anaheim, CA June 28-June 30, 2013. Future Business Leaders of America-Phi Beta Lambda, Inc. is a national organization that serves over 225,000 high school, college, and professional members. Missouri FBLA is a state association of FBLA-PBL with 15,442 members in 403 chapters across the state, the second largest chapter in the nation. The FBLA-PBL mission is to bring business and education together in a positive working relationship through innovative leadership and career development programs. The Grand River Technical School chapter of Future Business Leaders of America (FBLA) competed in district competition on Tuesday, February 19, at North Central Missouri College in Trenton. Maura Sturguess, District 19 President, and Anna Pitchford, Secretary, helped lead the opening session and distribute awards later in the day. Twenty-seven members finished in the top five places in a variety of events. Savannah Sturguess was elected as District 19 Secretary and Jaylene Sturguess as Treasurer for the 2013-2014 school year. 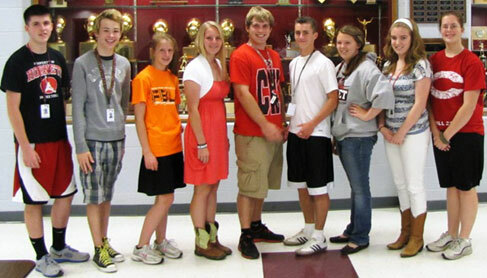 District 19 Officers were elected for the 2013-14 school year. President Nora Faris (Concordia High School), and Reporter Morgan Daniels (Hale High School). 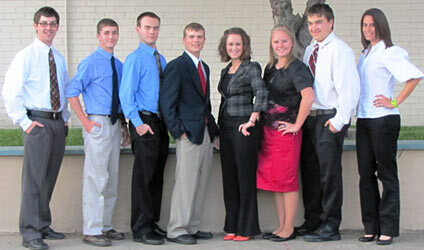 The following students qualified to compete at the State Leadership Conference in Columbia from April 21-23: Mindy Hayes, Accounting I; Maura Sturguess, Electronic Career Portfolio and Future Business Leader; Shelley Rucker, Introduction to Business Communication; Robert Parkey, Introduction to Parliamentary Procedures; Jaylene Sturguess, Trey Batye and Brett Clark, Management Decision Making team; Alan Kline and Jerod Cox, Business Plan; Caleb Hearon, Client Services and Entrepreneurship team along with Brittany Stanfield and Grant Peterson; John Stone, Computer Problem Solving; Savannah Sturguess, Database Design and Spreadsheet Applications; and Christopher Noble, Technology Concepts. If students finish in the top two at state, they will have the opportunity to compete at the National Leadership Conference in Anaheim, California. Other students who placed in the top five in a variety of competitive events include Anna Pitchford, Kerrigan Cosgrove, Madison Gregory, Cyrsten Lollar, Kelsey Baker, Savanna Shriver, Morgan Dowell, Cole Distler, Katherine Gaines, Joe Stevens, Alexys Jennings, and Jami Loney. Members competed in performance events at the District 19 Leadership Conference on February 19.
case studies and presenting solutions on a variety of topics. FBLA provides members the opportunity to hone their skills that will help them now and in the future. FBLA's mission is to bring business and education together in a positive working relationship through innovative leadership and career development programs. Jenny Hughes, Sondra Sturguess, and Susan Mayers are the FBLA Advisers for the GRTS chapter. Kelly Critten, student teacher from Northwest Missouri State University, also accompanied the students to the district competition. Thanks to the generous contributions of our community, the new Jerry Litton Memorial Stadium is currently being used for CHS sporting events. To commemorate this momentous year, Future Business Leaders of America (FBLA) is organizing a Stadium2Stadium 5K Walk/Run to be held Saturday, October 20, 2012, at 8:00 a.m. The event will begin at the old stadium on Miller Street and end at the new stadium on Hornet Drive. All walkers, runners, and couch potatoes, as well as sports teams, businesses, and groups are asked to join in. In addition, Dave Kinen, former CHS physical education teacher and coach, has ALS (aka Lou Gehrig's disease). Proceeds raised from this event will be donated to the ALS Foundation in honor of Coach Kinen to help fund research and support for those suffering from ALS. San Antonio, Texas - Grand River Technical School attendees Maura Sturguess, Elizabeth Sivill, and Savannah Sturguess represented the State of Missouri. Elizabeth advanced to the national level in Database Design (Microsoft Access) through her first place finish at state in April. At the Awards of Excellence program held on July 2, Elizabeth Sivill earned 10th place honors in her event. The three FBLA members arrived early for Nationals to attend the Institute For Leaders (IFL). This year's IFL was designed to celebrate innovative leadership and the dreamers of today destined to be the doers of tomorrow. The students were accompanied by Sondra Sturguess, FBLA Adviser. 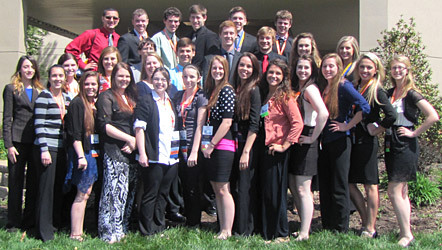 Members of the Grand River Technical School Future Business Leaders of America (FBLA) Chapter recently attended the 2012 Missouri FBLA Leadership Conference held April 22-24 in Columbia, Missouri. Over 2,750 members and advisers representing 426 chapters throughout the state met to elect state officers, transact business of the state chapter, participate in leadership and career workshops, and compete in the state leadership awards program. The GRTS chapter was also recognized for its participation in community service projects including Camp Quality, March of Dimes, Environmental Awareness, In Praise of Age, and Reach Out and Care. These community service projects are completed throughout the year by chapter members. Delegates representing the GRTS FBLA in the state competitive leadership awards program were: Derek Gray, Networking Concepts; Elizabeth Sivill, Database Design; Kelsey Baker and Johnson Young, Business Plan; Caleb Hearon, Job Interview; Team of Maura Sturguess, Annie Turbyfill, and Savannah Sturguess, Community Service Report; Team of Anna Pitchford and Tianna Snyder, Partnership with Business Report. Students competing in the State competition via online tests included Nathaniel Coleman, Business Math and Intro to Parliamentary Procedure; Taylor Gardner, Computer Problem Solving; Johnson Young, Spreadsheet Applications; and Anna VanOster, Health Care Administration. Winning recognition at the state conference were Elizabeth Sivill, 1st place Database Applications; Anna Pitchford and Tianna Snyder, 3rd place Partnership with Business Report; Maura Sturguess, Annie Turbyfill and Savannah Sturguess, 7th place in Community Service Project Report; Caleb Hearon, 8th place in Job Interview; and Nathaniel Coleman, 8th place in Business Math. Local advisers Jenny Hughes and Sondra Sturguess and accompanied the students to the conference. 3rd place winners in Partnership with Business Report. Elizabeth Sivill will be competing at the National FBLA Leadership Conference in San Antonio, Texas, June 27-July 2. Local officers Maura and Savannah Sturguess will also be attending and participating in leadership workshops. The Grand River Technical School chapter of Future Business Leaders of America (FBLA) competed in district competition on Tuesday, February 21, at North Central Missouri College in Trenton. Thirty-three members finished in the top five places in events, awarding the Sweepstakes Trophy to GRTS for the most points won in District 19. Maura Sturguess was elected District 19 President, and Anna Pitchford was elected as Secretary for 2012-2013. The following students qualified to compete at the State Leadership Conference in Columbia from April 22-24: Nathaniel Coleman, Business Math, FBLA Principles and Procedures, Introduction to Parliamentary Procedure; Taylor Gardner, Computer Problem Solving; Anna VanOster, Health Care Administration; Derek Gray, Networking Concepts; Elizabeth Sivill, Database Design; Johnson Young, Spreadsheet Applications; Kelsey Baker and Johnson Young, Business Plan Report; Marshelle Johnston, Impromptu Speaking; and Caleb Hearon, Job Interview. If students finish in the top two at state, they will have the opportunity to compete at the National Leadership Conference in San Antonio, Texas. Other students who placed in the top five in a variety of competitive events include Clark Allen, Laura Turner, Zach Parks, Kaleb Bagley, Grant Peterson, Maura Sturguess, Maggie McCoy, Savannah Sturguess, Mason Mayers, Caleb Coleman, Josh Williams, Juleah Littrell, Jon Englert, Austin Wieberg, and Shelby Asher. Jenny Hughes, Sondra Sturguess, and Susan Mayers are the FBLA Advisers for the GRTS chapter. 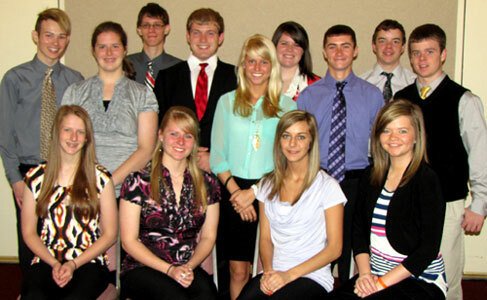 Members of the Grand River Technical School Future Business Leaders of America (FBLA) Chapter attended the 2011 Missouri FBLA Leadership Conference held on April 17-19 in Columbia, Missouri. Delegates representing the GRTS FBLA in the state competitive leadership awards program were: Bailey Keith - Ms. FBL, Alex Hager - Mr. FBL, Maura Sturguess - Database Applications, Stephan Burgos - Business Plan, Team of Laine Saunders and Josh Thieme - Digital Design, Team of Alex Hager, Carrie Boon, and Bailey Keith - Global Business, Clint Brinkley - Impromptu Speaking, Tianna Snyder - Introduction to Business, Kelsey Baker - FBLA Principles and Procedures, Team of Mary Kate Taylor and Maura Sturguess - Partnership with Business Report, Caleb Coleman - Business Communications. Winning recognition at the state conference were: Bailey Keith, Alex Hager, Carrie Boon - 4th, Global Business; Maura Sturguess - 5th, Database Applications; Stephan Burgos - 6th, Business Plan; Mary Kate Taylor, Maura Sturguess - 6th, Partnership with Business Report; Laine Saunders, Josh Thieme - 8th, Digital Design. 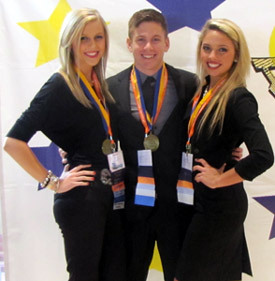 The Global Business team went on to compete at the National Competition in Orlando, Florida. 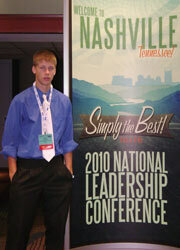 Caleb Coleman, a student from the FBLA chapter of Grand River Technical School, represented the state of Missouri at the National Leadership Conference in Nashville, Tennessee, July 14-17, 2010. Caleb competed in Introduction to Business. Click on photo at left to see a closer view. Future Business Leaders of America (FBLA) from Grand River Technical School held its annual recognition program on Wednesday, May 12. During the program FBLA members were recognized for their participation in various activities throughout the year including community service projects, district and state competitions. Chapter and individual projects were displayed and a slideshow was presented highlighting the year's events. Special awards were given to Hannah Morgan and Bailey Keith in honor of their outstanding leadership as District 19 officers. Hannah also led the initiative to raise money for earthquake relief for Haiti. Brandon Fuhrmann was given the Outstanding Senior award for his commitment to helping the chapter with community service projects, fundraisers, and his success at district and state competition. Cheyanne Reihner was given the Adviser award for her willingness to help throughout the year. Joyce Molloan, GRTS Vocational Resource Educator, was given special recognition for her assistance in assisting with the District 19 Leadership Conference. special recognition for their service and commitment to the Grand River Technical School chapter of FBLA. During the program the 2010-2011 local chapter officers were installed. The new officers include: President Maura Sturguess, Vice President Clint Brinkley, Secretary Stephanie Jordan, Treasurer Cerrina Winfrey, Reporter Caleb Coleman, Parliamentarian Nick Koenig, and Historian Maggie McCoy. Maura Sturguess and Nick Koenig will also serve as officers for District 19 during the 2010-2011 school year. 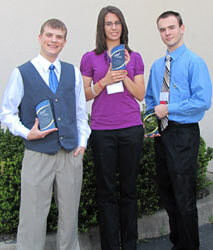 Members of the Grand River Technical School (GRTS) Future Business Leaders of America (FBLA) Chapter recently attended the 2010 Missouri FBLA Leadership Conference held on April 18-20 in Columbia, Missouri. Winning recognition at the state conference were: Mary Kate Taylor, 3rd Business Financial Plan; Brandon Fuhrmann, 3rd Business Plan; Kaley Hayward, 8th Database Design (Microsoft Access); Josh Thieme, 10th Digital Video Production; John Marlett, 1st E-Business website; Caleb Coleman, 3rd Intro to Business Communications; and Clint Brinkley, 9th Technology Concepts. Additional delegates competing included Hannah Morgan, Public Speaking II; Grant Peterson, Intro to Technology Concepts; Mason Munson, Cyber Security and Networking Concepts; Clint Brinkley, Computer Problem Solving; Kelsey Jones and Nick Koenig, Intro to Parliamentary Procedures; and Maura Sturguess and Nick Koenig, Local Chapter Annual Business Report. In addition, District 19 officers (President Maura Sturguess and Parliamentarian Nick Koenig) attended a district officers' meeting/workshop. Susan Mayers, Jenny Hughes, and Sondra Sturguess are the chapter advisers. 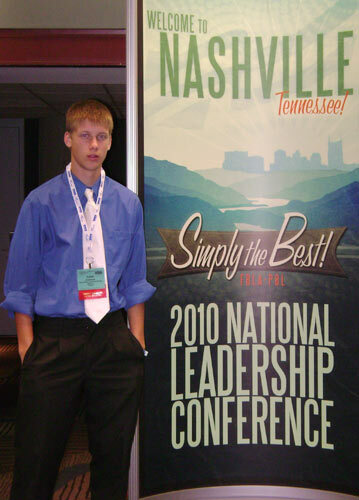 Two delegates from the GRTS FBLA chapter (John Marlett and Caleb Coleman) qualified to attend the National Leadership Conference in Nashville, TN from July 14-17, 2010. 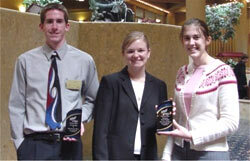 CAPTION: FBLA members receiving recognition for placing in the top 5 in their competitive events at the Missouri State Leadership Conference are, from left to right: John Marlett ( E-Business website, 1st place); Mary Kate Taylor ( Business Financial Plan, 3rd place); Brandon Fuhrmann ( Business Plan, 3rd place). Not pictured: Caleb Coleman ( Introduction to Business Communications, 3rd place). Click on photo for closer view. The Grand River Technical School chapter of Future Business Leaders of America (FBLA) competed in district competition on Tuesday, February 16, at North Central Missouri College in Trenton. GRTS was the host school this year, and many local businesspeople contributed by serving as judges. The Grand River Tech FBLA members accumulated the most points of all schools in the competition, winning the Sweepstakes trophy. Thirty members finished in the top five places in events. The following students qualified to compete at the State Leadership Conference which will be held in Columbia from April 18-20: Hannah Morgan, Public Speaking; Mary Kate Taylor, Business Financial Plan; Brandon Fuhrmann, Business Plan Project; Caleb Coleman, Intro to Business Communication and Network Design; Nick Koenig, Intro to Parliamentary Procedures; Grant Peterson, Intro to Technology Concepts; Clint Brinkley, Computer Problem Solving and Technology Concepts; Mason Munson, Cyber Security, Network Concepts, Network Design; Kaley Hayward, Database Design; Josh Thieme, Digital Video Production; John Marlett, E-Business; and Kelsey Jones, Intro to Parliamentary Procedures. If students finish in the top two at state, they will have the opportunity to compete at the National Leadership Conference in July in Nashville, Tennessee. FBLA provides members the opportunity to hone their skills that will help them now and in the future. FBLAs mission is to bring business and education together in a positive working relationship through innovative leadership and career development programs. 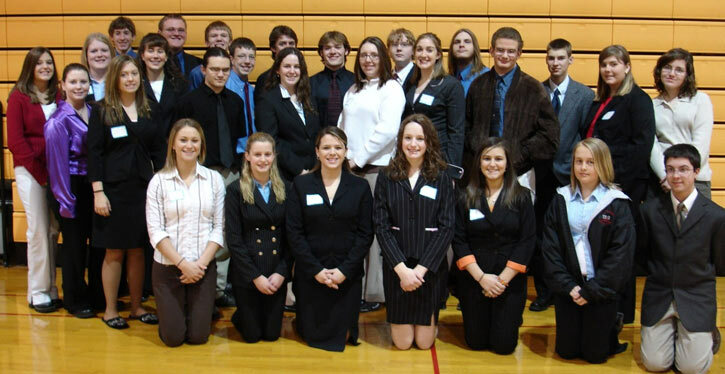 CAPTION: FBLA members representing Grand River Technical School included: Front row: Corie Donoho, Jacob Caughron, Jacob Peterson, Chelsea Sturguess, Drew Hinton, Steven Taylor, and Annie Steely. Second row: John Marlett, Hannah Morgan, Travis Henry, Brandon Fuhrmann, Kelsey Hinton, Samantha Fender, Cari Stockard, and Justin Littrell. Third row: Zach Colvin, Daniel Riekena, Ben Griffin, and Parker Leatherman. Not pictured: Wade Koehly and Mason Munson. 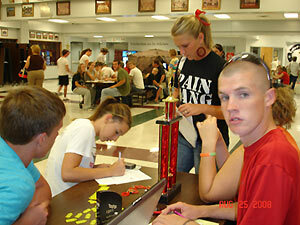 CAPTION: On August 25, 2008, FBLA representatives signed up new members at the annual CHS Activities Night held in the Commons. Several FBLA officers from Grand River Technical School recently attended the Future Business Leaders of America Officer Leadership Conference in Columbia, Missouri, August 4-5, 2008. Those attending included Jacob Caughron (President), Chelsea Sturguess (Vice President), Jacob Peterson (Secretary), Drew Hinton (Treasurer), Steven Taylor (Reporter), and Corie Donoho (Historian). Adviser Sondra Sturguess accompanied the officers. Over 500 students from across the state participated in leadership training lead by nationally known presenters Patty Hendrickson and Patrick Mauer. During the two sessions, students participated in team building activities, came to understand leadership styles and techniques and got a head start on planning for their chapter's activities during the upcoming school year. On Tuesday, students were able to choose from a series of workshops presented by state officers and chapter advisers, professional trainers and industry specialists. Topics ranged from finding money to fund a college education to preparing an attention getting resume to an introduction to the online alternative reality entitled "Second Life." Students were also able to attend workshops to help them function effectively in an elected or appointed office. Also during this time, district presidents were asked to help coordinate the voting sessions to update and change various state policies. The presidents were responsible to obtaining the voting decisions from their respective districts as well as facilitate one of the workshops held on Tuesday. Jacob Caughron, GRTS President and District 19 President, participated in these activities. Also a part of the district voting decisions was Chelsea Sturguess, GRTS Vice President and District 19 Reporter. This year's theme, "FBLA-PBL: Get the Edge!" challenges members to take the steps necessary to gain the competitive edge at school and in their communities. 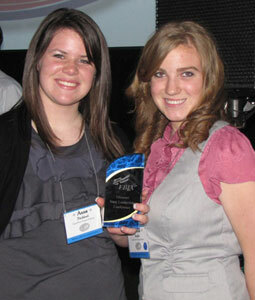 Missouri FBLA is the second largest chapter in the nation with nearly 16,000 members in 2008. The Officer Leadership Conference is an effective way for FBLA members to prepare for a successful school year. The GRTS officers held their own meeting to plan their Program of Work for the coming 2008-2009 school year. Some of the activities planned include: trash pick-up at the Chautauqua, passing out water during 5K run, Chamber luncheon PowerPoints, Camp Quality fundraiser, March of Dimes fundraiser, Reach Out and Care, In Praise of Age, Race Into Reading, Boo Fest help, Holiday parade help, FBLA week, Middle level recruitment, job shadow, career fair, and a children's carnival fundraiser. Several FBLA members are working towards their A (America) Business Achievement Award which is recognized at the National level. 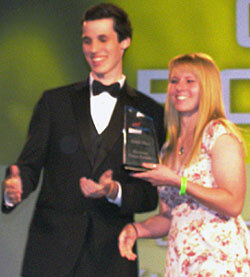 Nationals will be held in June 2009 in Anaheim, California. Opportunities to help in the community are welcome. CAPTION: Officers are all seniors and all are from Chillicothe except Jacob Caughron (Hale) and Corie Donoho (Southwest). Jacob and Corie are attending GRTS from those two area schools. To be appointed to their position, the officers had to complete an officer application and resume with recommendation letters then interview for their chosen position. They were interviewed by Crystal Narr and Amy Supple from Main Street Chillicothe who made recommendations to the advisers (Jenny Hughes, Susan Mayers, and Sondra Sturguess) on the best person for the positions available. The officers were then inducted into their positions during the May 2008 Recognition Night. Also, two of the officers are District 19 (covering 20 local school districts) officers who were voted into officer by the district FBLA members during the February 2008 district competition. District 19 officers are Jacob Caughron, President and Chelsea Sturguess, Reporter. The officers began their duties (both GRTS and District 19) starting in August 2009. The pictures details are (front row): Corie Donoho (Co-Historian), Chelsea Sturguess (Vice President and District 19 Reporter), Andrea Stanley (Co-Historian) and (back row): Jacob Caughron (President and District 19 President), Jacob Peterson (Secretary), Drew Hinton (Treasurer), Jared McCauslin (Parliamentarian), Steven Taylor (Reporter). 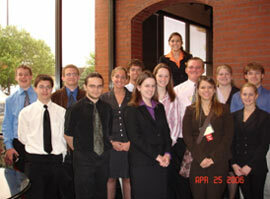 Members of the Grand River Technical School Future Business Leaders of America (FBLA) Chapter recently attended the 2008 Missouri FBLA Leadership Conference held on April 20, 21, and 22 in Columbia, Missouri. FBLA is a career and technical student organization for all high school students participating in business programs. Over 2,600 members and advisers representing 426 chapters throughout the state met to elect state officers, transact business of the state chapter, participate in leadership and career workshops, and compete in the state leadership awards program. Delegates representing GRTS in state competition were: Shannon Baker, Sally Baldwin, Corey Baughn, Jaryn Black, Jacob Caughron, Chris Dufaux, Mercedes Forst, Drew Hinton, Parker Leatherman, Megan Moore, Hannah Morgan, Jacob Peterson, Morgan Saunders, Joey Stagg, Cari Stockard, and Chelsea Sturguess, and Steven Taylor. Winning recognition at the state conference were: Corey Baughn, 3rd place, Business Plan; Shannon Baker, Drew Hinton and Hannah Morgan, 3rd place, Partnership with Business; Jacob Peterson and Chelsea Sturguess, 3rd place, Community Service Project; Chris Dufaux, 6th place, Cyber Security; Mercedes Forst, 7th place, E-commerce; and Jacob Caughron, 8th place, Business Calculations. FBLA sponsors Business Achievement Awards based on completion of activities in service, education, and progress under level F, B, L, and A. 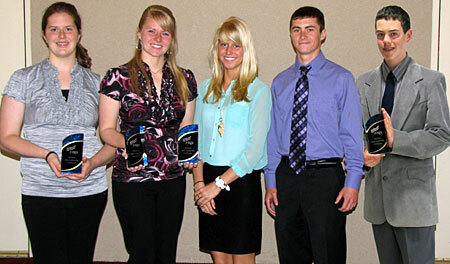 Recipients included Chelsea Sturguess, Jacob Peterson and Jacob Caughron. Sondra Sturguess, Susan Mayers, and Jenny Hughes are the local chapter advisers and accompanied the students to the conference. 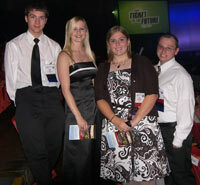 Students from the Grand River Technical School chapter of Future Business Leaders of America (FBLA) attended the National Fall Leadership Conference held in Cincinnati, Ohio, November 8-10, 2007. 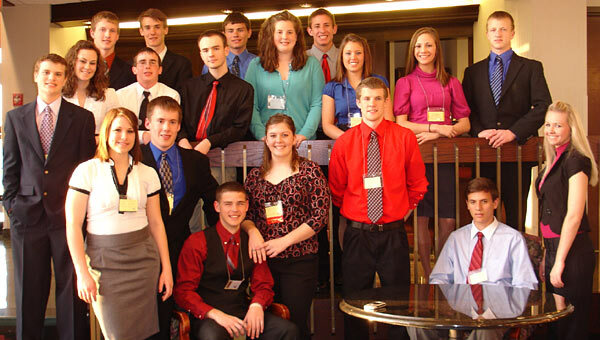 The 2007-2008 FBLA national theme is �Leadership in Action,� and FBLA members participated in workshops focused on Business, Career Development, Communications, Finance, Leadership and Information Technology. Motivational speaker Byron Garrett, co-author of the popular book The ABC�s of Life, inspired the students to reach their potential. Scott Seay, chief workshop bear of Build-A-Bear Workshop� shared about the vision and mission of the Build-a-Bear business during the conference�s closing session. Along with the conference activities, students enjoyed visiting the Indianapolis Motor Speedway, the Newport Aquarium in Newport, Kentucky, and the opportunity to network with other FBLA members from several states. Students attending were Corey Baughn, Jacob Peterson, Katie Forsyth, Corie Donoho, Chelsea Sturguess, Megan Moore, Jacob Caughron, and Weston Souders. The members were accompanied by adviser Jenny Hughes. CAPTION: FBLA members L-R: Corey Baughn, Jacob Peterson, Katie Forsyth, Corie Donoho, Chelsea Sturguess, Megan Moore, Jacob Caughron, and Weston Souders. 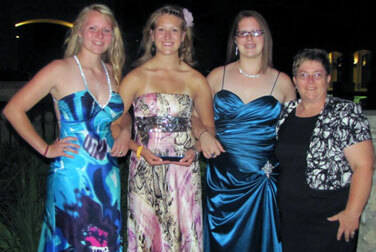 GRTS students attend FBLA national conference and receive top honors. 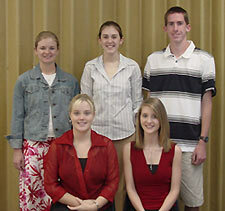 Corey Baughn, Xandria Colvin, Chris Shirk, and Chelsea Sturguess represented the state of Missouri at the Future Business Leaders of America-Phi Beta Lambda National Leadership Conference (NLC) in Chicago, Illinois, June 28-July 1, 2007. 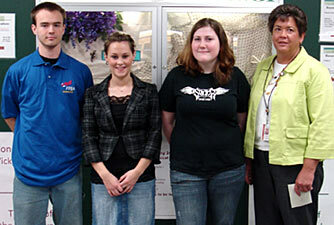 They were accompanied by adviser, Sondra Sturguess. The students competed in FBLA-PBL's national awards program and vied for top honors against state representatives from across the United States, Puerto Rico, the Virgin Islands, Bermuda, Guam, the Cayman Islands, and the Department of Defense schools worldwide. Corey Baughn and Chris Shirk competed in E-Business and placed 6th in the Awards of Excellence held on July 1 at the University of Illinois-Chicago (UIC) Pavilion. This event is new in the 2006-2007 year and consists of the creation and design of a Web commerce site for their FBLA organization along with a presentation at NLC. A panel of judges then conducts a question and answer session. Xandria Colvin and Chelsea Sturguess competed in Partnership with Business. They didn't place in the top 10 but they did represent our state and GRTS well. This event consists of creating a 30 page report (based on specific guidelines) dealing with the FBLA organization's partner. Our partner is the Chillicothe Area Chamber of Commerce. They also had to give a presentation at NLC along with the judge's question and answer session. The competition is part of a competitive events program sponsored annually by FBLA-PBL, a professional association for students pursuing business careers. Individuals, local chapters, and state teams compete in over 50 events representing a range of business, career, and leadership development activities. The winners of these challenging and prestigious awards are selected from FBLA-PBL's 250,000 members, and have won state and regional competitions to qualify for the national awards program. The 7300 delegates to the 55th annual conference elect national student officers and attend business and leadership workshops in addition to competing in business and career skill events. This year's national theme, "FBLA-PBL: Your Ticket to the Future!" reflects the goals of FBLA-PBL members and advisers, some of the best and the brightest of today's young people. The members arrived two days early to attend the Institute for Leaders (IFL) being held June 27-28, 2007 in Chicago, Illinois as part of the activities proceeding NLC. They participated in the Principles of OfficerShip track and were a part of a program of outstanding speakers, dedicated members, and powerful business leadership training. When the students weren't testing, they attended workshops, went through campaign booths, participated in voting sessions, and took in some of Chicago's attractions. Chris and Xan are graduating seniors, Corey will be a senior, and Chelsea will be a junior this coming school year at Chillicothe High School. Chris and Xan would like to carry on in the college version of FBLA called PBL. Both Corey and Chelsea have indicated that they are looking forward to making Nationals again next year. "The students did a fantastic job and learned so much. They set in on some of the final presentations and will be even more prepared for the coming years. They have met members from several other states who will be friends for a lifetime. It was a wonderful experience", said Sondra Sturguess, FBLA Adviser. Future Business Leaders of America-Phi Beta Lambda, Inc., (FBLA-PBL) is a nonprofit education association. They are the largest and oldest student business organization who is celebrating its 65th year. They have over 250,000 members and advisers in 12,000 chartered chapters worldwide. Its mission is to bring business and education together in a positive working relationship through innovative leadership and career development programs. To learn more, see FBLA-PBL's web site at www.fbla-pbl.org or call 800-FBLA-WIN. 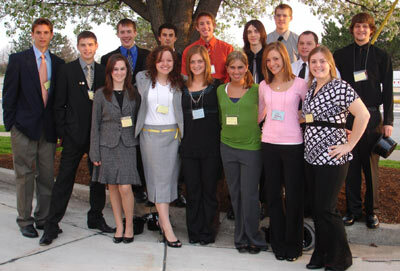 Fourteen members of the Grand River Technical Future Business Leaders of America (FBLA) Chapter attended the 2006 Missouri FBLA Leadership Conference held April 23-25 in Columbia, Missouri. FBLA is a career and technical student organization for all high school students participating in business programs. Over 2,400 members and advisers throughout the state met to elect state officers, transact business of the state chapter, participate in leadership and career workshops, and compete in the state leadership awards program. Jenny Hughes, Susan Mayers, and Joyce Mollohan, local chapter advisers, accompanied the students to the conference. Members of Future Business Leaders of America (FBLA) partnered with the local Habitat for Humanity chapter to create a calendar of home maintenance tips for Habitat homeowners. Megan Sharp, Natalie Hughes, and Eric Stockard researched web sites and interviewed Tony Figg, chairman of the Building Committee for Habitat, to create a list of suggestions that would help the homeowners maintain their homes. The students wanted to present a gift to the Habitat owners that would not only be pretty and personalized, but also practical. Pictured: Natalie Hughes and Megan Sharp with completed calendar. The Future Business Leaders of America (FBLA) chapter sponsored by Grand River Technical School competed in district competition on Monday, February 20, in Higginsville. 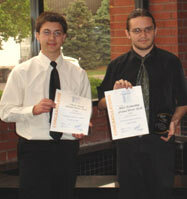 Twenty-nine students competed in 33 different events ranging from accounting tests to web page design. Click on photo to see a closer view! 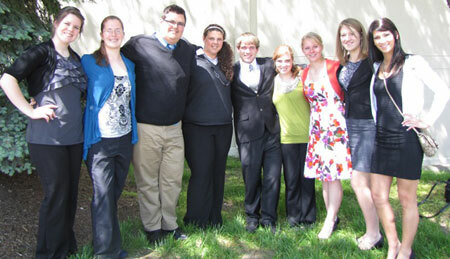 Fourteen students finished in the top of their events and will be competing at the state level in Columbia April 23-25. Students going to state are Madison Pulliam (accounting and business law), Ben Nibarger (accounting), Alex Economu (business plan), Dillon Harp (economics), Eric Stockard (economics), Natalie Hughes (job interview), Randie Lowe (Ms. Future Business Leader), Chris Shirk (networking concepts), Tyler Way (public speaking II), and the parliamentary procedure team of Xandria Colvin, Geana Gates, Rebecca Kerr, Allie Peters, and Tyler Way. The FBLA chapter won the Sweepstakes Trophy, representing the most points won by a chapter in the district. Other award winners finishing in the top four of their events were: Becca Fender, Kayla Sensenich, Parker Leatherman, Ashley Lent, Shala Moore, John Riekena, Katie Daugherty, Heidi McCoy, and Reace Huss. 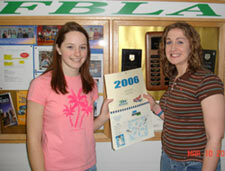 FBLA advisers accompanying the group were Jenny Hughes, Susan Mayers, and Joyce Mollohan. The Future Business Leaders of America (FBLA) chapter from Grand River Technical School participated in a competition practice day on Wednesday, January 25. 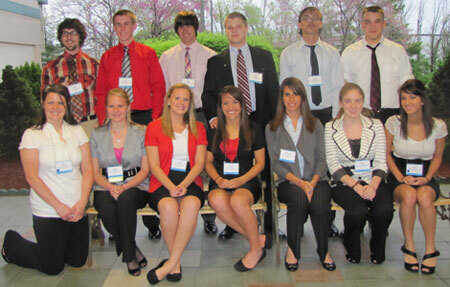 North Central Missouri College in Trenton hosted the special event, and GRTS had 37 students competing. GRTS teachers Joyce Mollohan and Jenny Hughes were the accompanying advisers. First place winners were Daniel Allen and Reace Huss, Desktop Publishing; Alex Economu, Networking Concepts; Madison Pulliam, Accounting II; Lynda Bonnette, Marketing; and Randie Lowe, Ms. FBL (Future Business Leader). Second place winners were Chelsea Sturgess, Introduction to Business Communication; team of Xandria Colvin, Rebecca Kerr, Allie Peters, Tyler Way and Geana Gates, Parliamentary Procedure; Reace Huss, Technology Concepts; Eric Stockard, Economics; Becca Fender, Accounting II; Parker Leatherman, Computer Concepts; and Morgan Lollar, Banking and Finance. Students were treated to a free lunch on the NCMC campus and invited to participate in tours of the college. The Phi Beta Lambda (PBL) chapter sponsored the FBLA event as a preparation for district competition which will be occurring on Monday, February 20. The mission of FBLA is to bring business and education together in a positive working relationship through innovative leadership and career development programs. 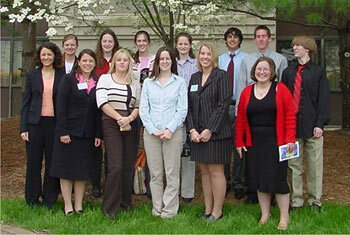 Thirteen members of the Grand River Technical Future Business Leaders of America (FBLA) Chapter attended the 2005 Missouri FBLA Leadership Conference held April 17-19 in Columbia, Missouri. Daniel actually tied for 1st place with the highest score but was awarded second place based on his completion time. FBLA rules require all ties to be broken based on the order in which tests are turned in to judges. Sometimes �seconds� count! Daniel Leatherman (Accounting II) and Katie Nibarger and Kayla Riekena (Business Plan Project) qualified for national competition to be held June 24-27 in Orlando, Florida. National competition has become second nature to Katie Nibarger as this marks her third consecutive year to achieve the honor of competing at this level. Last year she and fellow FBLA member Kayla Riekena, who will be making her second trip to nationals this year, placed sixth in the nation with their Partnership with Business Project. This year, their goal is to place even higher with their Business Plan Project. Twenty students from the Grand River Technical School�s Chapter of Future Business Leaders of America (FBLA) took part in the district contest and captured the Sweepstakes Trophy at District 19 Competition held at Trenton High School on Saturday, February 26. To achieve this honor, Grand River Tech FBLA members had to earn more points by winning more events than other schools in the competition. They have accomplished this feat for seven of the past eight years. One of the highlights of the day was Daniel Leatherman achieving the coveted title of Mr. Future Business Leader. Daniel completed a written test covering FBLA knowledge, as well as a broad business background including accounting, business technology, economics, parliamentary procedure, etc. A panel of three judges, who also critiqued his letter of application and resume, then interviewed him. 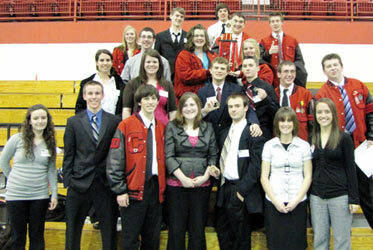 Leatherman achieved first place and earned the honor of advancing to state competition. Overall, GRTS FBLA members won eleven first place awards, four second place awards, six third place awards, one fourth place award, and two fifth place awards, for a total of 24. Accompanying the students to district competition were Jenny Hughes, Susan Mayers, and Joyce Mollohan, FBLA advisers. 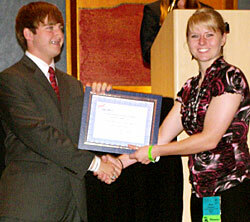 The 2005 FBLA State Leadership Conference will be held April 17-19 at Holiday Inn Select in Columbia. 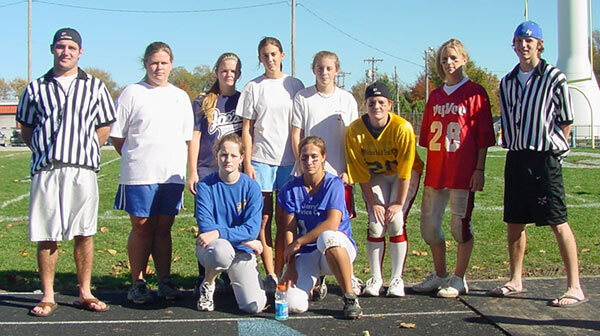 The Grand River Technical School's chapter of Future Business Leaders of America sponsored a powder puff football game on Saturday, October 23, at Jerry Litton Memorial Stadium. The proceeds will be given to a local charity. 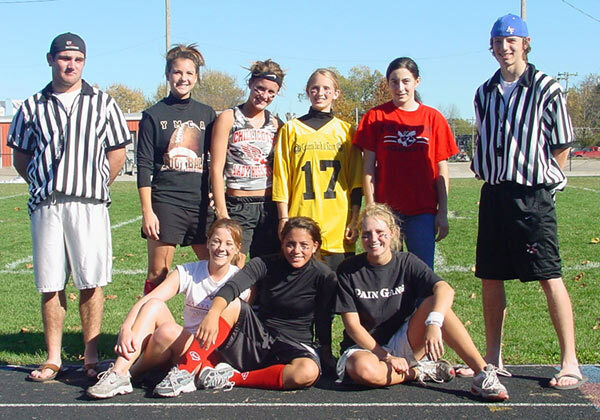 The team of sophomore/junior girls dominated the freshmen/senior girls, much to the dismay of the senior girls! However, much fun was had by all. A special thanks goes to the teams, the officials (Clint Macoubrie and Matt Perry), and the crowd for making this an entertaining event for a good cause. Members of the game-winning team were Bailey Benson, Angel Maxwell, Maggie Weldon, Tara Jeffries, Kimberly May, Mandy Brock, April Williams, and Andrea Walter. Senior/freshmen team members included Rachel Hughes, Amber Parker, Megan Thompson, Katie Nibarger, Kayla Riekena, Kate Lindley, Katie Quinn, and Christy Todd, and Meghann Gilliland. 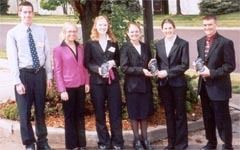 Caption: The Grand River Technical School FBLA Chapter members who placed in the top 10 in their respective competitions at the 2004 Missouri FBLA Leadership Conference held on April 18-20 in Columbia, Mo., were, from left: Daniel Leatherman, Morgan Truesdell, Lauren McDaniel, Katie Nibarger, Kayla Riekena, and Brad Alden. Members of the Grand River Technical School's Future Business Leaders of America (FBLA) Chapter recently attended the 2004 Missouri FBLA Leadership Conference held on April 18-20 in Columbia, Mo. During the conference three members -- Katie Nibarger, Kayla Riekena and Lauren McDaniel -- qualified to advance to the National Leadership Conference in Denver, Colo. on July 14-17. Nibarger and Riekena earned second place for their partnership with business project and Lauren McDaniel earned second place for her word processing 2 project. Other students who earned recognition at the state conference were Brad Alden, Mr. Future Business Leader, fourth place; Katie Nibarger, word processing 1, sixth place; Daniel Leatherman, accounting 1, eighth place; and Morgan Truesdell, business plan project, ninth place. 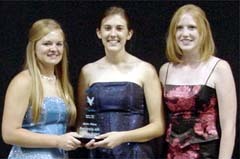 Caption: Three local Future Business Leaders of America club members recently competed in the FBLA national conference in Denver, Colo. Katie Nibarger (left) and Kayla Riekena (middle) were honored for placing sixth in the nation for their Partnership with Business Project and Lauren McDaniel (right) competed in the Word Processing II event during the conference. Three members of the Grand River Technical School's Future Business Leaders of America (FBLA) Chapter recently traveled to the National Leadership Conference with their year-long projects, with one project finishing sixth in the nation. Katie Nibarger, Kayla Riekena and Lauren McDaniel participated in the national conference which was recently held in Denver, Colo. The students were accompanied by FBLA Adviser, Jayme Caughron. McDaniel competed in the Word Processing II event and Nibarger and Riekena competed in the Partnership with Business Project. 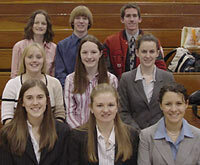 Nibarger and Riekena's Partnership with Business Project for the 2003-2004 school year was a financial literacy program seminar for high school students. "They worked on this seminar project throughout the year," said Caughron. The actual seminar was held at the Grand River Technical School in March. More than 30 businesses from the Chillicothe area contributed to the seminar and seven local business leaders served as guest speakers for the day. Following completion of the seminar, the girls prepared a written report describing their project and evaluating its success. They sent this to national headquarters to be judged prior to the conference. During the national conference, the girls presented a two minute oral abstract on their project. Caughron reported that the projects were then ranked, based on both the written report and the oral presentation. "They qualified for finals," said Caughron. "Therefore, they were then required to make a 10 minute oral presentation, using visual aids." During the national conference awards ceremony, Nibarger and Riekena were presented with sixth place in the nation for their business seminar project. According to Caughron, every state in the United States is allowed to submit two Partnership with Business Projects to the national conference. Therefore, Nibarger and Riekena's award as sixth in the nation is quite an honor. McDaniel, who took a Word Processing II project to the conference, took an onsite production test and this was submitted for judging prior to the contest. Caughron reported that during the national conference, McDaniel competed a written test covering her knowledge of word processing. "She is the first student I have had in Word Processing II class to go on to nationals," said Caughron of McDaniels' accomplishments. McDaniel will receive her national scores at at later date. The Grand River Tech Future Business Leaders of America recently held their Officer Installation and Recognition Program at the Grand River Technical School. Prior to the installation program, officers were selected by submitting an application and through an interview process. Presiding president, Morgan Truesdell, installed new officers for the upcoming 2004-2005 school year. New officers are: President, Katie Nibarger; Vice president, Kayla Riekena; Secretary, Dan Leatherman; Treasurer, Kerry Radcliff; and Reporter, Chanel Allen. Recognition was given to members, staff, and community members who has been very supportive and assisted the chapter in various ways throughout the year. Certificates of Appreciation were given to Ron Wolf, Director at GRTS; Roger Wolf, Assistant Director; Debby Perry, Counselor; and Nancy Burtch, Technical Math instructor. Special awards were given to members who have shown outstanding support to the chapter, local advisers, and to the community. Special recognition plaques were awarded to Morgan Truesdell, Chapter President Award; Brad Alden, Outstanding Senior of the Year; Christin Ulmer and Jennifer Bonnett, Adviser�s Award; J�Nae Shannon, Outstanding Service Award; Kayla Riekena and Katie Nibarger, Outstanding Service Award��Financial Literacy Workshop�; Brad Alden and Katie Ponting, Outstanding Senior FBLA Member; and Devon Doss and Brad Alden, Four-Year Service Award. Every member received a certificate of participation. The program ended with a slide show recapping the activities of the year and saluting the senior FBLA members.